The next step was locating a replacement drive and disc. 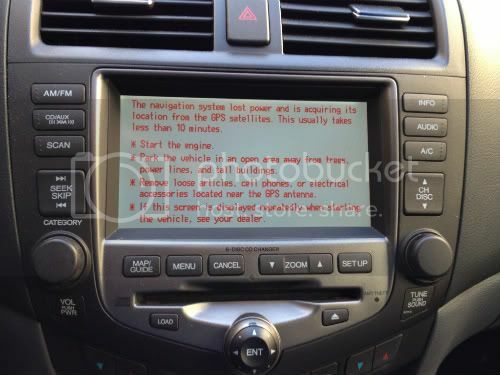 Fortunately, I was able to find a reputable vendor who specializes in Honda navigation system repair. They also do Acura system repairs so I highly recommend them. When you conduct your search, be sure to select a vendor that has an established business and website. They might charge a bit more but the peace of mind and additional communication is worth it in my opinion. After a phone call to address any worries I had, I sent the drive in for service. It was important I send them the drive, but also the disc and the navigation security code so they could completely troubleshoot the issue. Originally I thought perhaps the shock absorbers in the drive had failed, thus causing the disc scratching. However, the technician told me the “OK” button missing is actually due to a PCB board issue within the drive. I didn’t ask how or why the disc became scratched but that seems to be the reason the “DVD disc reading error” would sometimes come up. It was about $375 for them to repair the drive and I also needed an updated navigation disc. A replacement disc on eBay was about $95 but the shop fixing my drive quoted me $98. I figured for the additional $3, I’d have them to bug if I ran into any issues. In a few days and nearly $500 later, the refurbished drive and new navigation CD were in my hands. After re-installing the unit and powering up again, we received the “acquiring its location from the GPS satellites” message. After about 10 minutes of driving around, this message disappeared and normal operation began. Reinstalling the drive was another five minute job (make sure you set aside the mounting screws in a safe place). After turning the car on, and entering the navigation security code, the navigation system came back to life and we haven’t had any issues with it since. It’s also nice that we now have a 2012 navigation disc that is up-to-date. Some additional advice I’d like to provide – save all your bills and paperwork related to this fix! Honda (Acura) has a service bulletin open for this issue, but they’ve stopped short of a full blown recall. In the future, Honda might recall certain models that are likely to experience this issue. If you already did the fix prior to a potential recall, Honda will only reimburse you if you can provide a receipt for the work done. This happened to my dad’s old 1991 Honda Civic for a bad ignition coil, fortunately he had all his paperwork and was reimbursed. Another thing to consider, you’ll be able to use your radio, CD player (if equipped) and climate controls while the navigation drive is out, but the touchscreen will be completely dead until the navigation drive is hooked up again. Make sure you’re comfortable using the buttons for everything until your drive is fixed and reinstalled. That’s about it – if this article was helpful please comment below and share your experience. Alternatively, a Facebook like or Google+ is also appreciated. I received the inquiry below and thought it best to post and respond on this article thread for the benefit of viewers. Interesting issue you report below. For our 2006 Accord, I confirmed all the touchscreen functions and navigation are managed in the DVD drive itself, which resides in the trunk. If possible, I’d suggest swapping your drive and nav DVD with another similar model and see if that solves the issue – if so you know the issue is with the drive and/or DVD. If you can’t do this test, I’d send the drive and navigation DVD into an expert anyway as that’s probably where the issue is. If they confirm there’s no issues, then the next thing I’d check would be all the connections and hardware you can access. Please let us know how it goes and thanks for sharing! Acura is a good car, but I don’t trust the service department at the dealership in Alpharetta, GA. Several years ago, I had a problem with the hands free link draining the battery. The local Acura said not true. From a dealership out of town, I got a copy of the service bulletin, showed it to the local dealership and still had a major arguement to get the part replaced. Haven’t had a bit of trouble since.